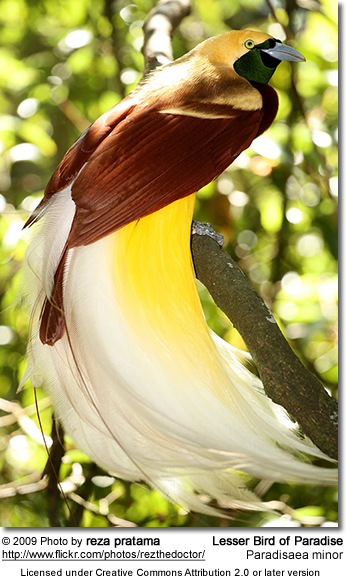 The Birds of Paradise or Cendrawasih are members of the family Paradisaeidae of the order Passeriformes (Perching Birds). They live in tropical forests, including rainforest, swamps and moss forest. The members of this family are perhaps best known for the plumage of the males of most species, in particular highly elongated and elaborate feathers extending from the beak, wings or head. 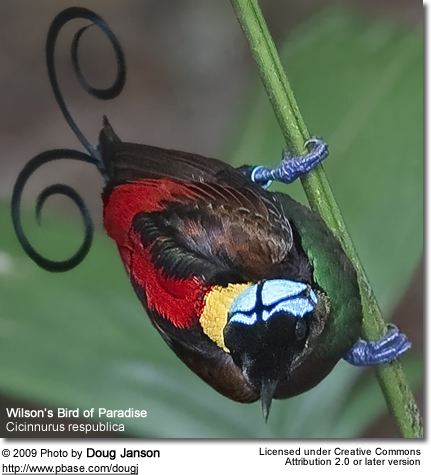 As part of the Birds-of-Paradise Project through the below dazzling video was taken by Cornell Lab scientist Ed Scholes and National Geographic photographer Tim Laman. As the below trailer shows, the opulent plumes and fantastical dances of these 39 species astound us, leaving us with the most profound of scientific questions: Watch them dance. Birds of paradise are generally crow-like in general body-form, and, indeed are the brother group to the Corvids (crows and jays). They have stout or long bills and strong feet, with around two-thirds of the species being strongly sexually dimorphic. In most species, the diet consists predominantly of fruit, although riflebirds and sicklebills also favour insects and other arthropods. Most species have elaborate mating rituals, with the Paradisaea species using a lek-type mating system. Others, such as the Cicinnurus and Parotia species, have highly ritualised mating dances. Males are polygamous in the sexually dimorphic species, but monogamous in at least some of the monomorphic species. Hybridisation is frequent in these birds, suggesting the polygamous species of bird of paradise are very closely related despite being in different genera. Many hybrids have been described as new species, and doubt remains regarding whether some forms, such as Rothschild's Lobe-billed Bird of Paradise, are valid. Despite the presence of hybrids, some ornithologists hypothesise that at least some putative hybrids are valid species that may be extinct. Birds of paradise build their nests from soft materials, such as leaves, ferns, and vine tendrils, typically placed in a tree fork. Clutch size is somewhat uncertain. In the large species, it is almost always just one egg. Smaller species may produce clutches of 2-3. Eggs hatch after 16–22 days, and the young leave the nest at between 16 and 30 days of age. The manucodes are the most primitive members of the group. 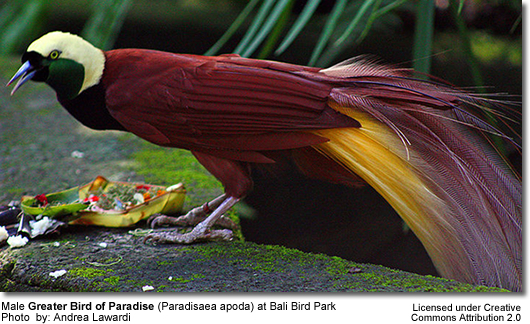 Best known are the members of the genus Paradisaea, including the type species, the Greater Bird of Paradise, Paradisaea apoda. This species was described from specimens brought back to Europe from trading expeditions. These specimens had been prepared by native traders by removing their wings and feet so that they could be used as decorations. This was not known to the explorers and led to the belief that the birds never landed but were kept permanently aloft by their plumes. This is the origin of both the name "birds of paradise" and the specific name apoda — without feet. Societies of New Guinea often use bird of paradise plumes in their dress and rituals, and the plumes were popular in Europe in past centuries as adornment for ladies' millinery. Hunting for plumes and habitat destruction have reduced some species to endangered status; habitat destruction due to deforestation is now the predominant threat. Hunting of birds of paradise has occurred for a long time, possibly since the beginning of human settlement. It is a peculiarity that among the most frequently-hunted species, males start mating opportunistically even before they grow their ornamental plumage. This may be an adaptation maintaining population levels in the face of hunting pressures, which have probably been present for 30 millennia. Hunting birds of paradise for their plumes for the millinery trade was extensive in the late 19th and early 20th century, but today the birds enjoy legal protection and hunting is only permitted at a sustainable level to fulfill the ceremonial needs of the local tribal population. In the case of Pteridophora plumes, scavenging from old bowerbird bowers is encouraged. When King Mahendra of Nepal was crowned in 1955, it was found that the bird of paradise plumes of the Nepali royal crown were in need of replacement. Due to the hunting ban, replacements were eventually procured from a confiscated shipment seized by the United States Customs Service. The southern hemisphere constellation Apus represents a bird of paradise. 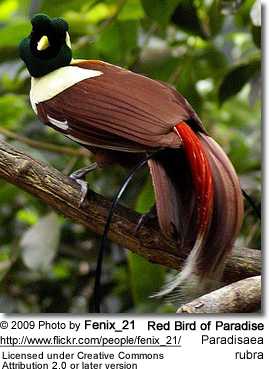 An adult-plumaged male bird of paradise is depicted on the Flag of Papua New Guinea. Copyright: Wikipedia. This article is licensed under the GNU Free Documentation License. It uses material from Wikipedia.org. Additional information added by Avianweb.